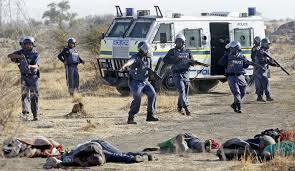 The Bench Marks Foundation in South Africa has published comments on various aspects of the Farlam Commission report on the Marikana Massacre. Bench Marks Executive Director John Capel highlights some of the weaknesses in the Farlam Commission’s mandate into investigating the incidents at the Lonmin Mine in Marikana in the North West Province of South Africa during August 2012 and calls for the establishment of a fund that will adequately compensate the widows and orphans affected by the events of 16 August 2012. Bench Marks says that the Farlam Report raises issues about mining stability as a whole. Benca Marks welcomes demilitarisation of the police but says that private security companies need investigation. Finally, Bench Marks Chairperson, the Rt Revd Jo Seoka, Anglican Bishop of Pretoria, comments on the significance of the report’s findings.